First published in 2013-04-13 in Computer Sweden. The year was 2009. The warning lights were blinking. The clouds were approaching. Unsure, immature, hyped, and with a seductive price tag. A customer commissioned me to make a check list of services that could be placed in the cloud. The answer was simple: any services, as long as they are not connected to the rest of one’s infrastructure and don’t contain sensitive information. I hope you never need to retrieve the information. Curtain-fall. The year is 2013. The price tag is still seductive, but the situation is different. The market is maturing. The larger suppliers are listening to their customers. Although contracts are standardised, they are premised on the customer being a professional purchaser. Now one has to make the right choice, not abstain from buying. The pitfalls are many, but the rewards are lower prices, flexibility, and in some cases higher security. Personal information has been a major obstacle for cloud giants. Therefore a construction called Safe Harbor has now been implemented, meaning that American companies pledge to abide by European legislation. This pertains not only to one’s personal information – all one’s information is accessible only in countries with reasonable legislation. However, Patriot Act and FISAA trump Safe Harbor, which is mportant for Swedish public authorities to keep in mind. Integration with the rest of one’s infrastructure has been another problem. Nowadays, however, one might connect cloud services to the existing Active Directory and the transition is invisible to users through a single Sign On. Naturally, this has to be done in a secure way. Both outsorcing and cloud suppliers are often ISO 27001 certified. Keep in mind that the certificate does not always pertain to outsorced activities. As pertains to cloud suppliers, the services as such are certified. Don’t misunderstand me. I am not advocating placing everything in the cloud. There are lots of things to keep in mind. Cloud Security Alliance will help you with risk information, control lists, and so forth. We should, however, ask ourselves why whole IT enterprises are to be outsorced if, in some cases, it is both more secure and cheaper to make use of clearly demarcated cloud services. I don’t want to go into too many details and spoil the surprise but Nova stumbles on something that can have global repercussions. We dig into cyber security, angels, family secrets, and much more before the surprising and explosive finale. Åsa Schwartz is the leading lady of eco fantasy and her new book En Död Ängel [A Dead Angel] is an ominous eco thriller, a sequel to Nefilim that takes us into the supernatural. It was a real page-turner I read in one go. This gets a warm recommendation as a more cerebral fantasy experience. Presse here for the complete review. Nephilm is Åsa Schwarz third book after …And Shackle Lilith in Chains and Stigma. The first two are connected but I can’t see any relationship with them and Nephilim. When I read Nephilim two books came to my mind: The Da Vinci Code and Stieg Larsson’s Millennium-series. The main character here, Nova Barakel, has some similarities with Lisbeth Salander even though she is not quite as extreme and thereby more believable. When it comes to the story it is a typical thriller with action and biblical mysticism in an (un)holy mixture, but contrary to Dan Brown the wording is more nimble and restricted to a reasonable amount. Nova is a Greenpeace activist who is involved in a plot where she is supposed to paint insults on the walls in the home of Vattenfall’s [a major Swedish corporation] VP because Vattenfall is at the top of the list of companies that pollute the environment. When she is has written on a few places in the apartment she discovers that the owner is actually at home – murdered. Nova flees, but realises that she will be one of the people that the police will want to contact. After that opening the story alternates between Nova and the police officers that are trying to catch the killer (including a couple of flashbacks). As usual, the interchanging thriller perspective makes you want to know what happens to the person you just left and therefore read some more, so this book is easy to finish. On paper this is Fantasy, but the fantastical elements are explained to the reader rather than being shown directly. Based on what is actually shown you could say that it is all a scam in order to make Nova believe in the right things, however there is nothing in the book to supports this interpretation. Summarily it is, simply, a really good thriller. 3. The characters are interesting. When you finish the novel there are a lot of loose ends, which makes you want more. 4. The author uses real names and real companies which gives it a feeling of reality. 5. Stockholm is a beutiful city and Åsa Schwarz description of it and her small anecdotes of buildings that exist in real life doesn´t make it worse. 6. The element of occultism, religion and the supernatural is very “in” at the moment. You can google the word Nefilim. Press here fore the complete review. Nephilim is a given star on this autumns crime spectrum and moreover a, just as vital as worrying, contribution to the climate debate. As in her earlier books And Shackle Lilith in Chains and Stigma Åsa Schwarz writes nimbly and with a well-balanced richness of detail. The suspense and the tempo never waivers and upon re-reading it you notice how well thought out the story is. Inviting culinary descriptions and interesting anecdotes from a Stockholm long past intensifies the sense of intimacy. While her previous novels are more occult thrillers, Nephilim is directed at a much larger readership, which is good, because Åsa Schwarz deserves to be read by many. I would thus like to recommend it very much! Åsa Schwarz was born in 1973. She is a writer and IT security consultant. She works parttime at Cybercom and writes during the remainder of her time. She debuted in 2005 with And Shackle Lilith in Chains and in 2006 Stigma was published. These two novels are part of a series called the Demonology. 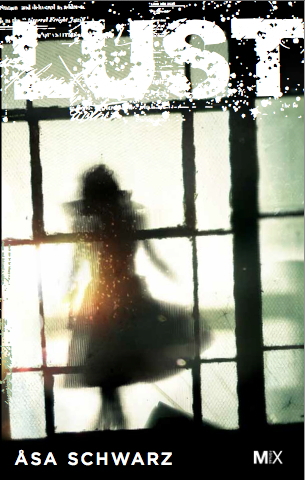 Nephilim is Åsa’s latest novel, which was published in 2009 and is separate from the other two. Plot: Nova Barakel is an environmentalist who’s about to break into the apartment of Vattenfall’s VP to tag his walls with slogans. When Nova is in the bedroom she discovers two people and a dog brutally murdered in the bed. She flees, but unfortunately leaves evidence behind and is later suspected of the murders. Nova’s mother has died in a car crash and one day the mother’s lawyer rings Nova. He wants her to come to his office together with a representative from a foundation called the FON. They are going to split the mother’s 53 million kroner inheritance, fifty-fifty. When Nova and the representative, Peter Dagon, arrive at the lawyer’s office he tells them that Nova will be able to keep the house in Gamla Stan1, which is valued at 13 million kroner, as well as art, effects and shares worth 13.5 million kroner. FON are allotted 26.5 million in shares. Nova wonders what this has to do with her mother. Together with her environmentalist friends, Nova is out to scare some more “polluters”. Next in line is the VP of Scandinavian Airlines. But somebody beats them to it and murders him as well. One night when Nova is in another “environmental criminal’s” apartment she discovers a lot of blood. Someone is fleeing the scene – it’s the murderer. When Nova discovers who’s trying to escape and who is the most likely culprit, she is dumbfounded. Detective inspector Amanda is in charge of the murders. She is having a relationship with the medical examiner Moses. Amanda is now starting to suspect Nova for all of the three murders. She tries to reach Nova but Nova escapes from her house in Gamla Stan, makes a cash- withdrawal at the bank and tries, unsuccessfully, to flee the country. She has also found out that Moses is unreliable he too is a Nephilim. Finally the police arrests Nova and she is faced with the difficult task of declaring her innocence. She tells Amanda and Moses but it’s not something Amanda wants to hear. She has just gotten the news that she is pregnant with Moses child, which she wants to tell him as soon as possible. However, when Moses finds out about it he is far from overjoyed. He demands that Amanda should have an abortion immediately. Shortly after this Amanda does a check up on Moses and finds out strange things about him. She is starting to believe Nova’s story more and more. Amanda and her colleagues come up with a plan for how Nova is going to help them catch the killer. The ending is thrilling, but I’m not revealing any more. READ IT YOURSELVES! I think: That Åsa Schwarz yet again creates an incredibly exciting book. Already after And Shackle Lilith in Chains I was hooked on Åsa’s mysterious world, with bible quotations and suspense that gives you goose bumps. The book is a page-turner and I sometimes feel like I’m a part of the plot. Åsa really knows how to write enthrallingly. It’s excitement from the first page to the last. I can hardly wait for her next book. Åsa IS addictive. Trailer for Nefilim by Åsa Schwarz. The novel Lust will be released in Sweden the 4th of June.